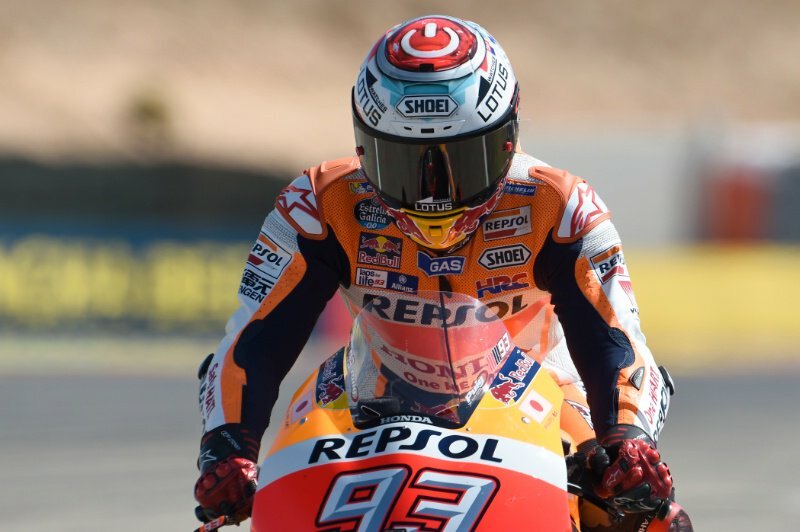 It was Jorge Lorenzo’s (Movistar Yamaha MotoGP) turn to try out the gravel traps of MotorLand in Warm Up, as the reigning world champion suffered his first crash of the weekend to join a high profile list led by title rivals Marc Marquez (Repsol Honda Team) and Valentino Rossi (Movistar Yamaha MotoGP). 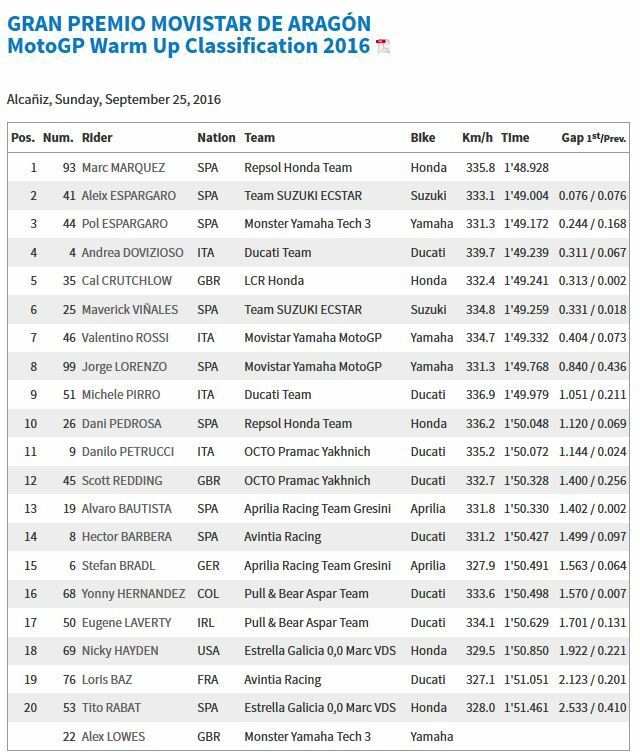 Marquez was quickest in Warm Up ahead of Aleix Espargaro (Team Suzuki Ecstar), with Pol Espargaro (Monster Yamaha Tech 3) completing the top three behind his brother. Ducati Team’s Andrea Dovizioso was P4 – where he qualified – with Cal Crutchlow (LCR Honda) in fifth. Maverick Viñales (Team Suzuki Ecstar) beat Valentino Rossi (Movistar Yamaha MotoGP) to P6, with early crasher Lorenzo back out to go eighth quickest ahead of Michele Pirro (Ducati Team). 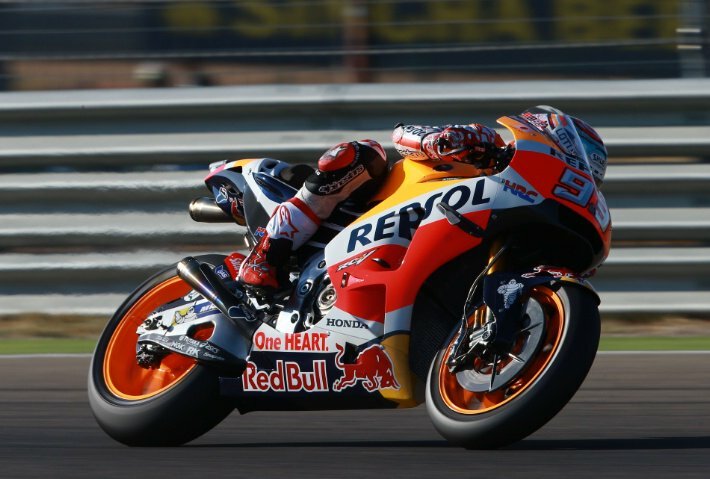 Repsol Honda Team’s Misano winner Dani Pedrosa completed the top ten in cooler conditions, with the race set for the warmer afternoon temperatures of 14:00 local time (GMT+2).